Descending the line. Photo: Nanna Kreutzmann. Shaun and Nora dancing at depth. Photo: Pete Atkinson. 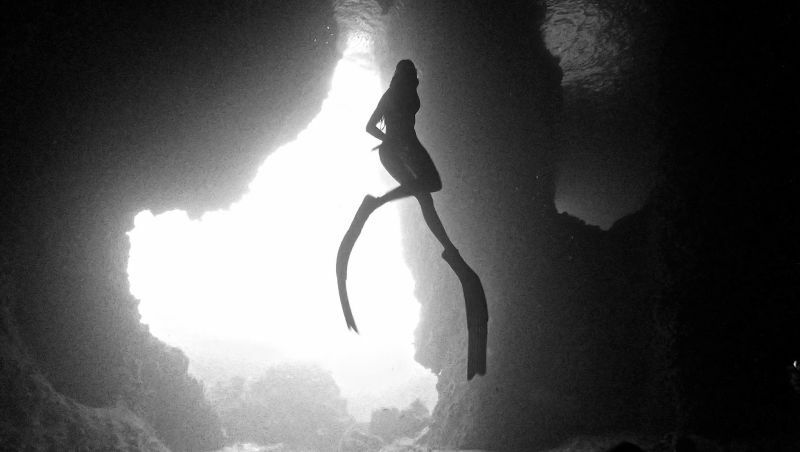 The beauty of freediving. Photo: David Sexton. In more recent times our desire to push our physical boundaries in sport, along with a need for a deeper connection with nature around us, has led to the emergence of a sea exploring freedom without the need for bulky equipment or air tanks to disturb the environment around the diver. That freedom is freediving. 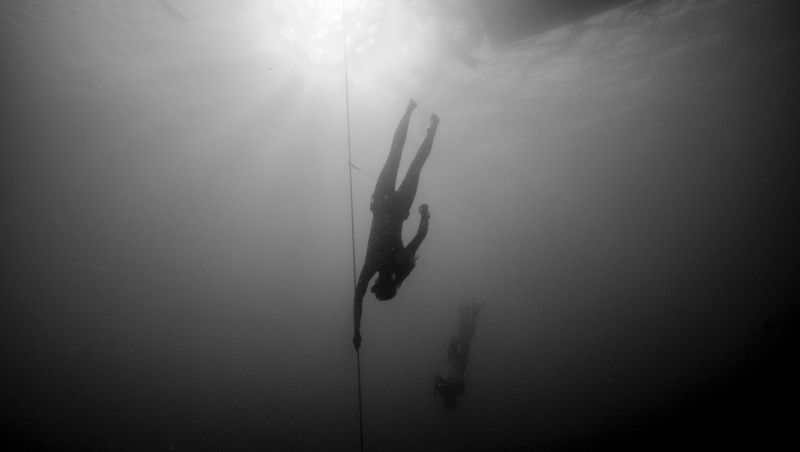 Freediving is a form of underwater diving that relies on breath-holding until resurfacing rather than the use of breathing apparatus such as scuba gear. As well as the obvious skill of having to hold one’s breath for extended periods of time, the freediver also has to contend with high ambient pressures at depth below sea level. As much as the physiological challenges, there are a host of psychological skills for the advanced freediver to master to successfully practice this most meditative and liberating of underwater sports. Although a seasoned diver, it was with some trepidation that I signed up for a trial session with the highly experienced and duly recommended team at We Freedive. My day was spent with the devoted and dynamic duo of Nora Galgoczy and Shaun Swinfield. If anything was to allay concerns of turning into Man from Atlantis in a single day, these were the two now-amphibious lifeforms to do it. As well as their core emphasis on safety and procedure combined with aeons of experience underwater, it is their infectious love of the ocean and marine conservation with an impassioned belief in their student’s capabilities that truly enables you to safely explore the boundaries of a new underwater experience with them. To give a sense of the achievable, it is worth a mention that Nora is the National Record breaker for her native Hungary at all depth disciplines, with a Personal Best time underwater of 4:58, having reached depths of nearly 50 metres. Yeah, let’s just see if I can get to 1:00 and 10 metres. So armed with a mask, snorkel, weight belt and freediving fins (much longer than their scuba cousin) I embarked on my morning training session at a private pool in Rawai which has a five-metre drop-off. Having run through all the theory, freediving education and in-water safety on dry land, Shaun proceeded to educate this novice on the core skills in the pool with the patience of a saint and the enthusiasm of a kid in a candy store. Most interesting to describe is the technique of Static Apnea, which prepares the individual pre-dive. Before submerging, the freediver floats on the surface with mask and snorkel, goes into a state of stillness, meditation, almost sleep-like… both creating calm and reducing the heart-rate before beginning the full breath technique which maximises your oxygen intake prior to the dive. After a few attempts and some fine tweaking I couldn’t believe it when I resurfaced to execute my newly taught Recovery Breathing technique to see Shaun grinning from ear to ear, “How long do you think you held your breath this time?” I really wasn’t sure, I actually did go ‘somewhere else’ that felt rather non-linear. “I don’t know, maybe a minute”, I hopefully responded. “One minute thirty,” he beamed. After a several-hour session of practice techniques including dynamic streamlining, body positions to reduce effort and safety tests with rescue procedures, it was time to head to the real waters. The long tail boat from Chalong Pier took us over to a stunning, secluded bay in Koh Hei. Whilst the journey by boat across this picturesque stretch of water is beautiful, I’ll admit to feeling apprehensive at converting my recent pool skills to the vastness of the open ocean. But with the sheer enthusiasm and delight in Shaun and Nora’s being and constant encouragement, you feel safe and sure to give it a good go, and wear a big grin while you’re at it. We anchored at the forested bay to be met with the squawks of hornbills and cries from an encircling aerie of sea eagles. Wow. Today is a good day. After kitting up, Shaun positioned a freediving buoy in the water. This is rather like a floating tyre which you can place your equipment in, prepare and rest on in the water, and supports a line and weight underneath which drops to the required metres below and becomes your reference point to manage your dive’s direction and depth. I lower myself into the water, swim to the buoy and begin to prepare myself. Let the games begin! Shaun talks me through and demonstrates the technique known as Free Immersion. Using your mask and snorkel you first begin to prepare using relaxation techniques to still the mind and body looking down at the depths. When calm and ready, you take your full breath using both your diaphragm and intercostal muscles, release your snorkel and slowly descend, drawing your body along the line beneath the buoy into the beyond. I’m fortunate, I can equalise fairly easily, but every few metres below you feel the pressure mount around your chest and head as a polite reminder to balance the pressure with your internal air. You watch the line, deeper you go, equalise and go. I’m only at 10 metres. But 10 metres in the big, vast blue with just me and my lungs is something else. At 10 metres, according to Boyle’s Law, the pressure of air that surrounds us has doubled from that on the surface, and your lung volume of gas-filled space is reduced by half. They’re all sensations that remind you that you’re in another world, new chartered territories for the fledgling freediver. But in this alien world you always have a buddy. And there’s Shaun at 10, still with a welcoming smile. I glance around the reef, and then we both slowly ascend together back up the line to the surface. Despite our body’s unnecessary reflex demand for air, which I felt strongly on reaching the 10 metre mark, the ascent is calm, the urgency is over as I slowly glide along the line back to the buoy, proceed with the recovery breath, and incurably join Shaun’s big grin on the surface. I practice Free Immersion diving along the line a number of times, gaining in confidence as well as calm. I feel comfortable to increase my bottom time by the weight at 10 metres, exploring the reef and inhabitants just that little bit longer before a euphoric ascent with my buddy. So next we move to the Holy Grail of all freediving. Constant Weight. Constant Weight diving uses all the skills in the sport to both descend and ascend in the dive. The key difference to Free Immersion is that whilst you still reference the line, you are removed from it physically. When prepared and ready, you move away from the buoy and duckdive to begin your descent. Using the line as reference, a slight kick of those extended fins and you’re on the way down… equalise, gentle kick and down you go. After your bottom time on the reef, still in reference to the line, you ascend slowly and naturally by having just the right amount of buoyancy created by the combination of the air in your lungs and the weights on your belt. Now we had quite a current underwater on this particular day, and it’s a wonderful sensation to streamline your body in the direction of the oncoming current, letting the water flow through you as you maintain your position and float gently to the surface. It’s extremely satisfying. After a number of practices of Constant Weight diving, and several hours in the water, I saved my best dive to last. Dropping to the reef, hanging there to take in the sights, pose for a photo or two (not my best side), and chuckle all the way to the surface. On the swim back to the boat there’s an added bonus. Nora, who has been diving around like a mermaid whilst Shaun has been looking after the plebian, finds a school of baby squid. She circles them so they move closer and linger with us in the water, performing a light show of different colours from the chromatophores in their skin, undeterred by our non-bubble blowing forms. It’s a magical end to a magical experience. The return journey on the boat is an elation. There’s a huge feeling of achievement, but something more… a renewed sense of respect with an environment that covers 71% of our planet. But thanks to the We Freedive team I am now armed with a mask, some fins and the skills to extend my relationship with the coastal reefs. Let’s be clear… this is not an extreme sport. Quite the opposite. This rather yogic discipline requires you to reduce your adrenaline and heart-rate for the sake of more oxygen and a streamlined form within the water. It’s this that creates a sense of wonderment and respect at truly being one with the vast expanse of our beautiful oceans and its fantastic beasts. It’s okay Ms J. K. Rowling. I now know where and how to find them.